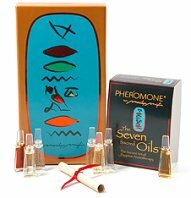 The Seven Sacred Oils collection contains seven oils cherished by ancient Egyptians for their powerful behavioral effects. They include Spikenard, to stimulate psychic powers; Olibanum, to stimulate the sense of smell; Palm, to revitalize energy; Myrrh, a cherished blood stimulant; Juniper, to calm and cleanse, Fo-ti-tieng, a sexual stimulant; and Lotus, to recall the sweetness of a woman. Marilyn Miglin discovered these special ingredients during a journey to Egypt, where she scoured temple reliefs and ancient hieroglyphs for hints of ancient perfume techniques. These recipes, in addition to traces of fragrances left on ancient perfume vessels, gave Marilyn Miglin unique insights into the treasured scents of the Pharaohs. The set retails for $125 and is packaged in a gold box that features the cartouche designed for Miglin by The Field Museum. Read more at marilynmiglin or fieldmuseum.org. Thanks to Sara for the tip! This oil gift set is of an outstanding quality. I recently purchased this item out of curiosity because of my love of scent and all things Egyptian. I've been a perfume aficionado since the age of five and have even experimented with creating my own perfume with fine essential oils, and I will have to say this oil set is finely crafted and well worth the price. My only gripe about the product is the packaging. Casing the oils in a wooden box instead of cardboard would make this set more impressive for the price. Glad to hear the scents are worth the price, even if the packaging isn't. Given the way fragrances are priced these days, I don't think you'd be likely to get a wooden box at this price, to be honest…so perhaps it is better that they made it affordable instead of doing luxe packaging?